Out of extreme boredom, I used up all my films that I reserved for the plans I had before. I'm not mad or anything, it's just that I want to do something and the universe tells me to stay at home. I only had 7 films on my Instax camera. Here are the random shots I made today. I apologize in advance for the mediocrity. Clockwise: My feet, my face, our window and what is supposed to be a mirror shot. So yeah, I learned that you can't do mirror shots or such on this camera. What a noob. Haha. 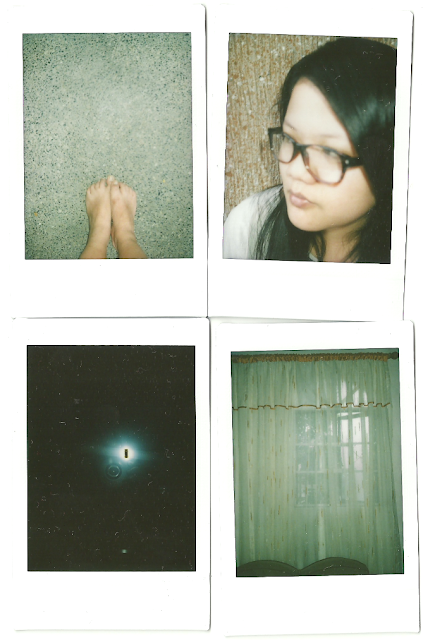 I was trying to do the double exposure thing but sadly, when I thought about doing that, I ran out of film. Maybe I should do more research first before wasting my films. And I do wish someone could take ~*~my~*~ photos so that I the pictures wouldn't look like Facebook default photos. More funny pictures in the future maybe. I wish I wouldn't be too lazy to go out tomorrow. Even if I'm alone. There are things and bills to pay. I'm supposed to go out right now, around 5 pm, but I guess that'll be cancelled too. I should just definitely go out tomorrow. Why do plans keep getting cancelled just about when I am ecstatic to go out. I am now very, very sleepy.